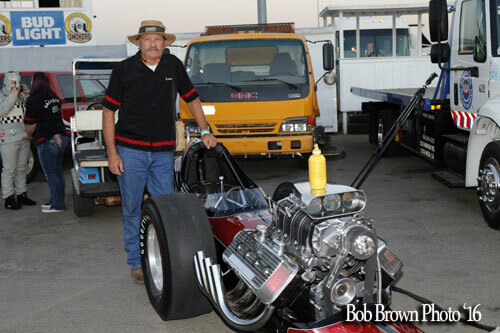 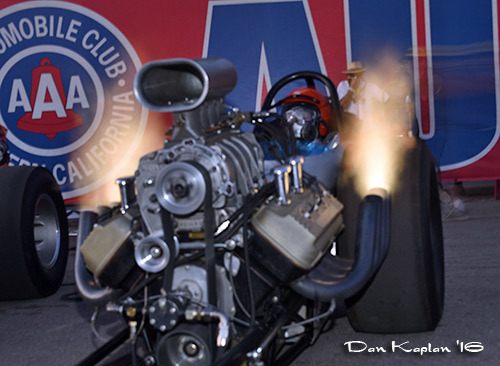 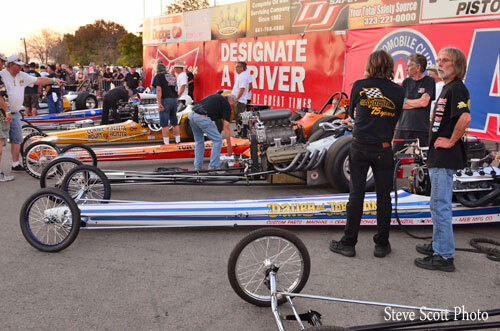 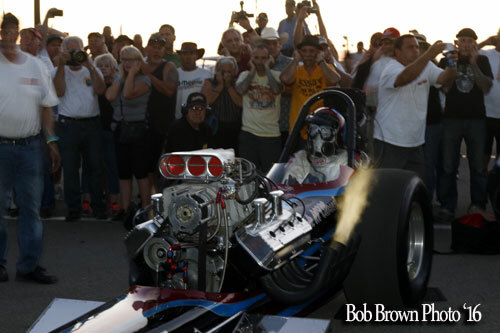 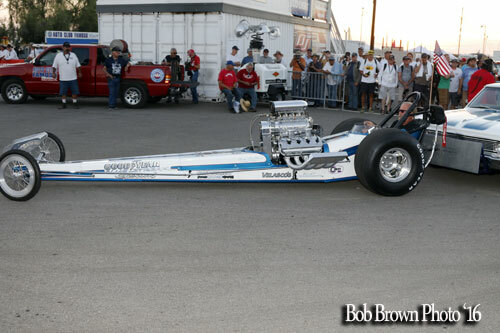 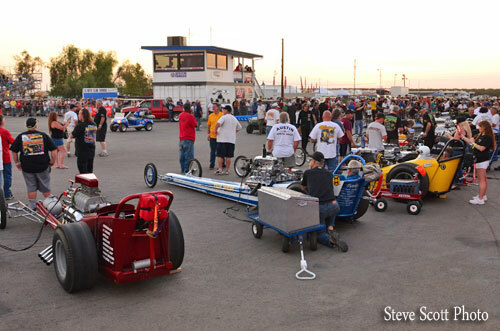 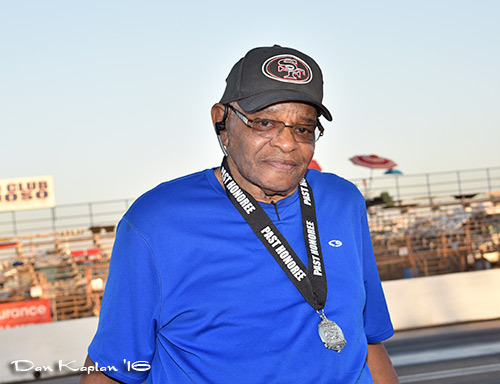 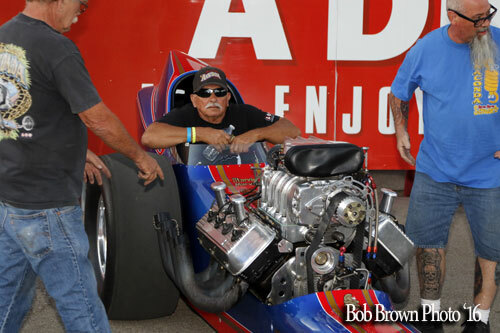 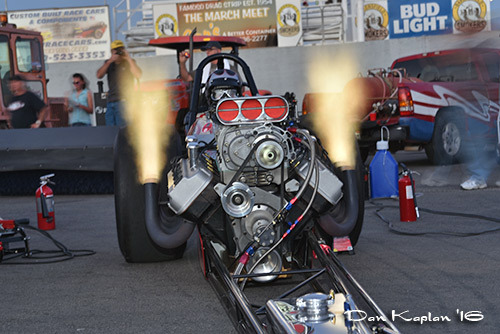 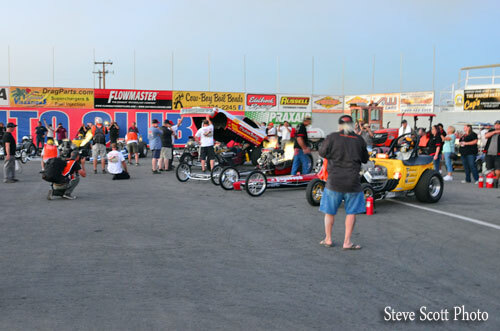 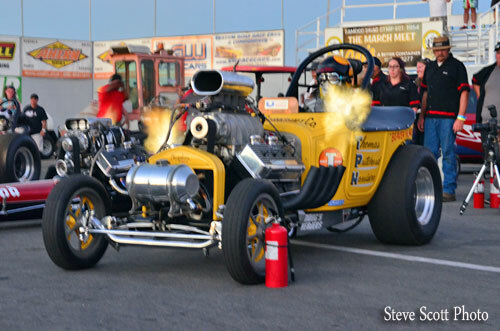 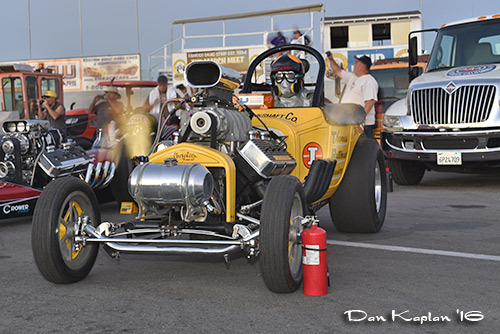 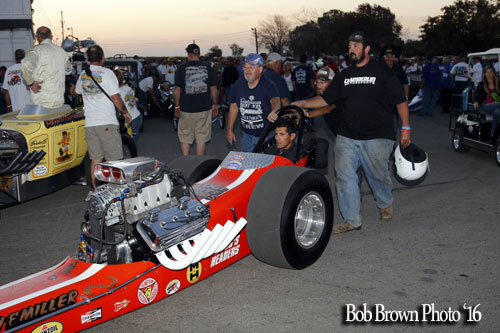 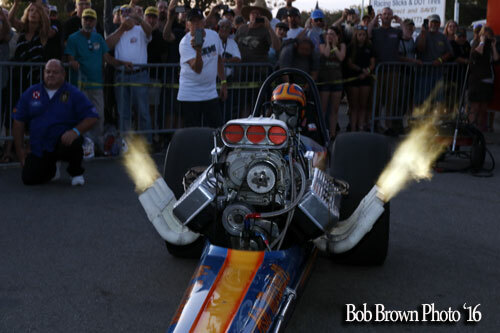 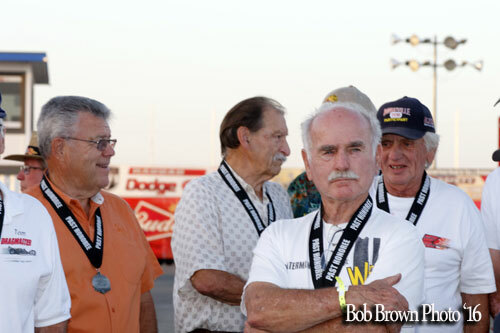 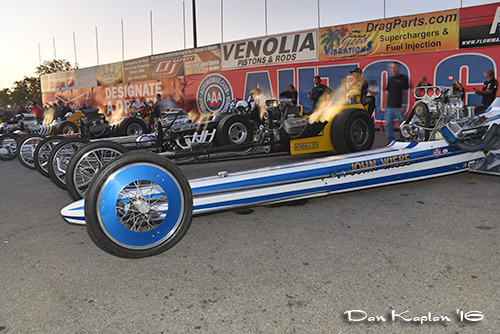 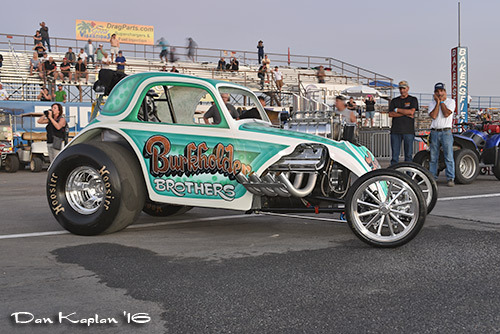 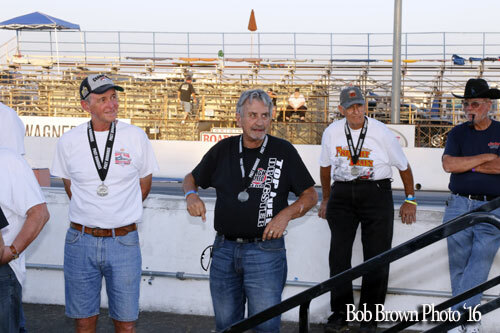 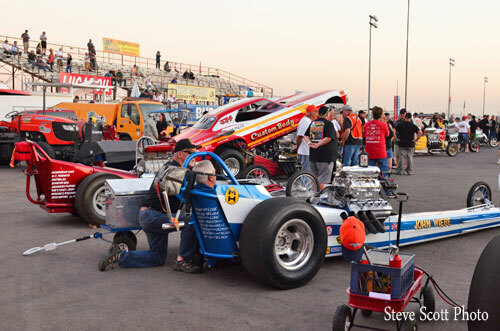 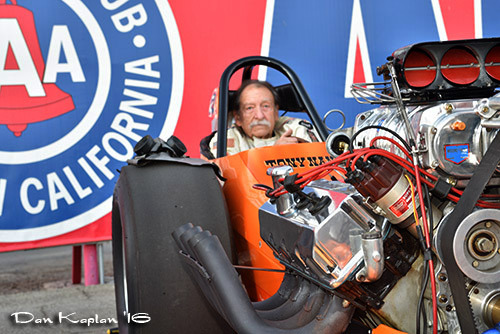 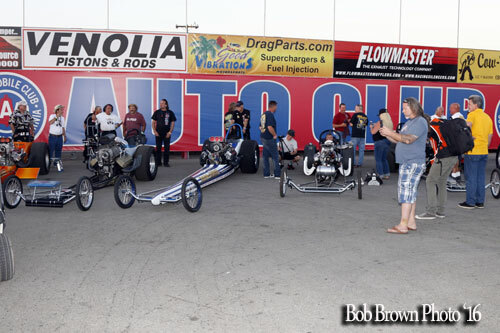 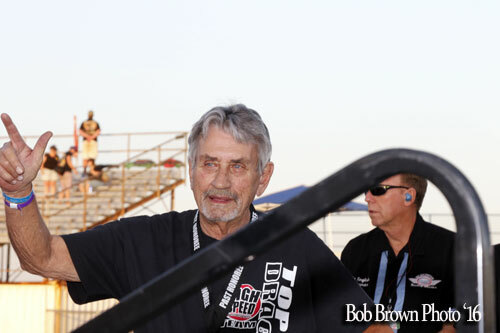 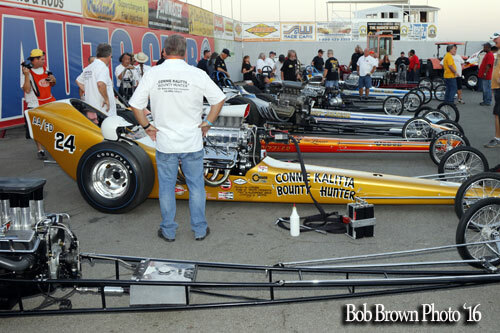 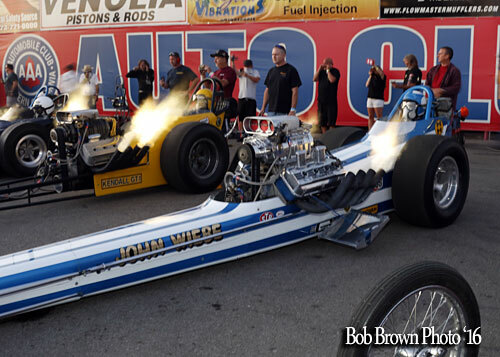 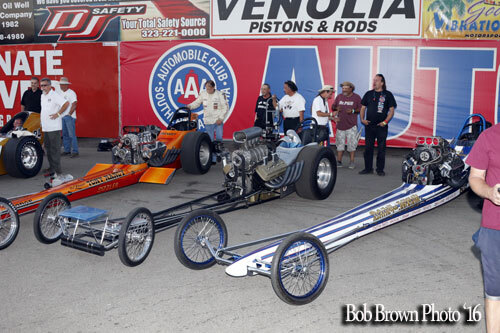 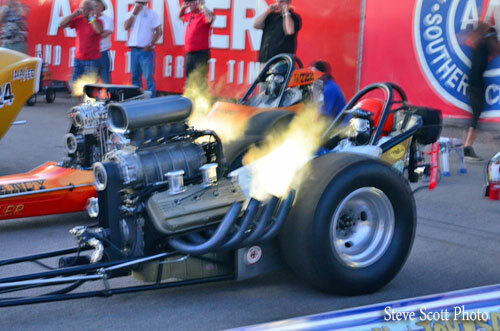 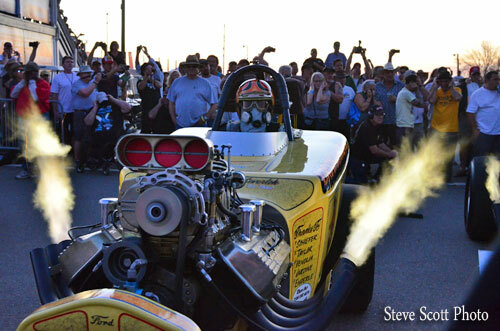 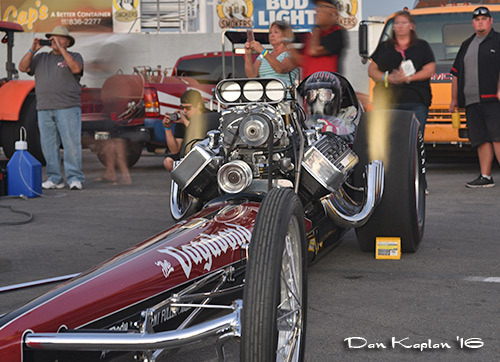 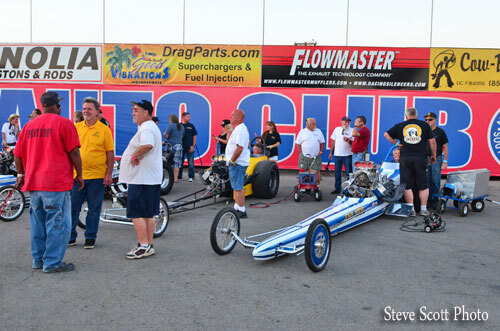 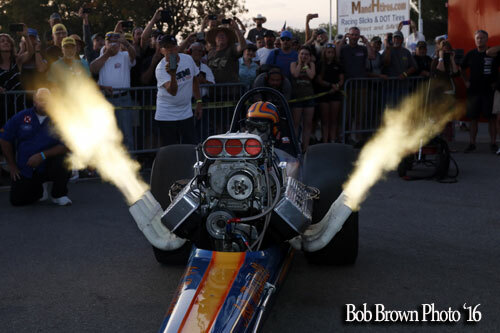 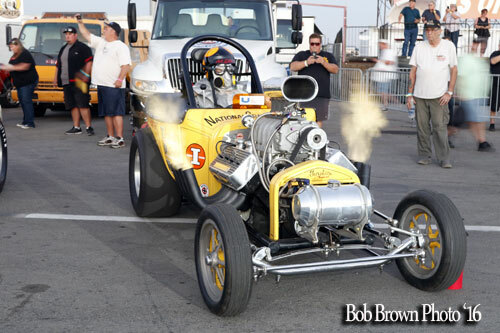 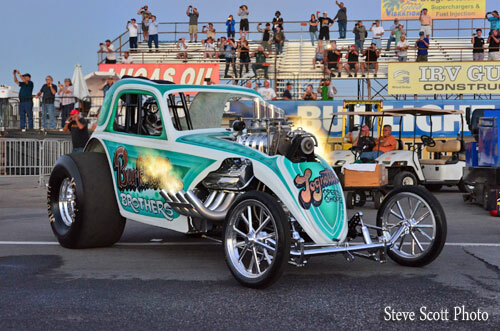 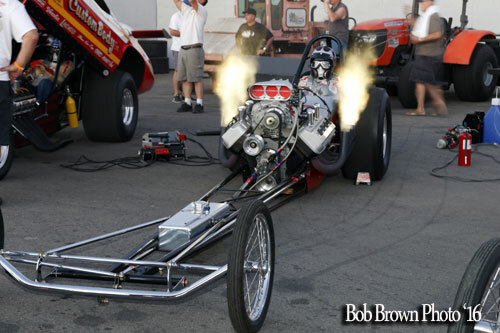 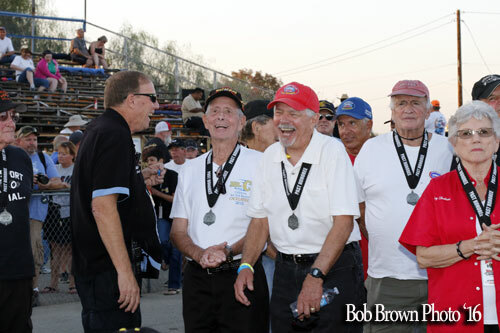 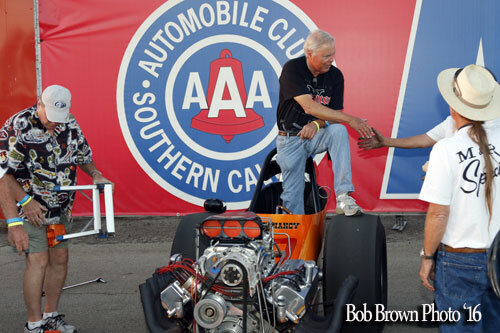 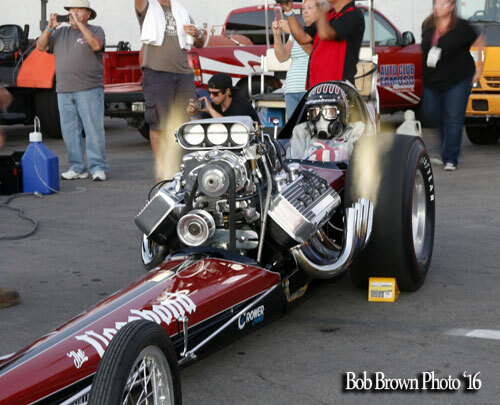 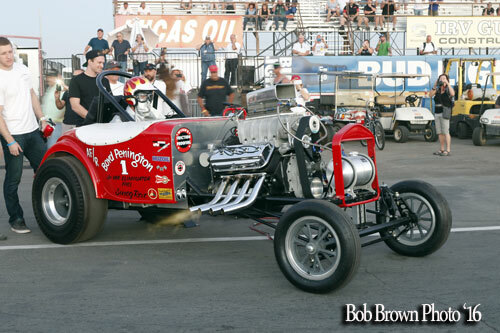 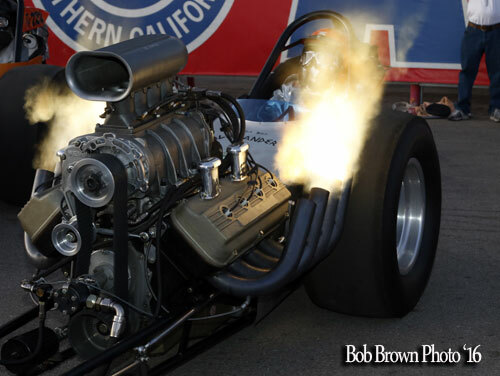 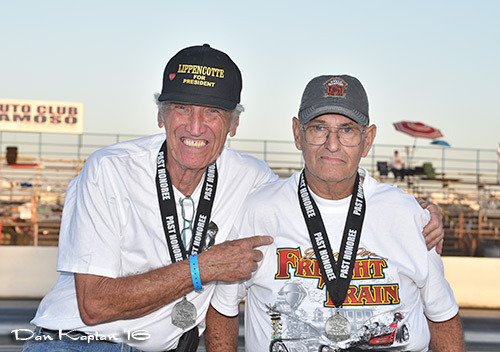 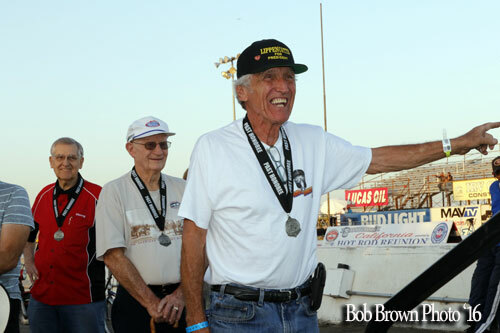 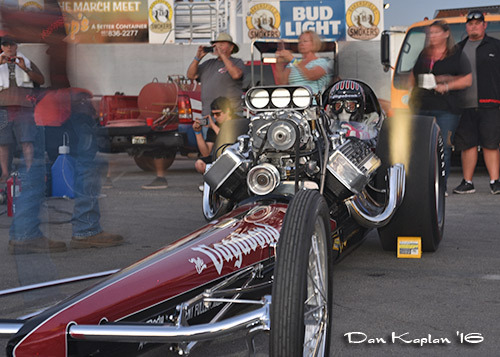 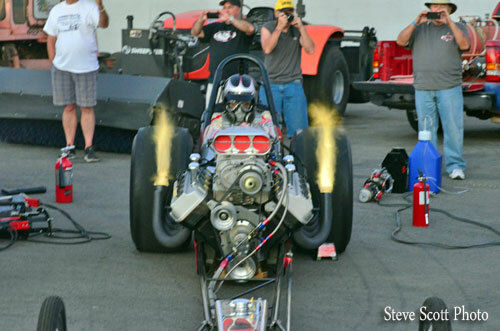 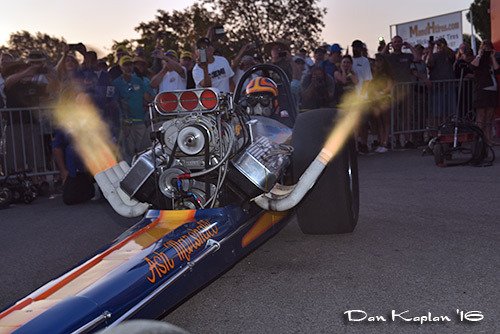 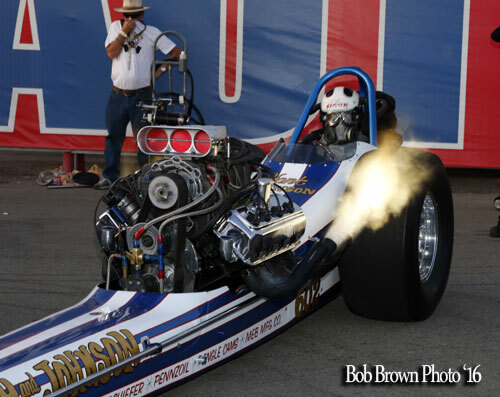 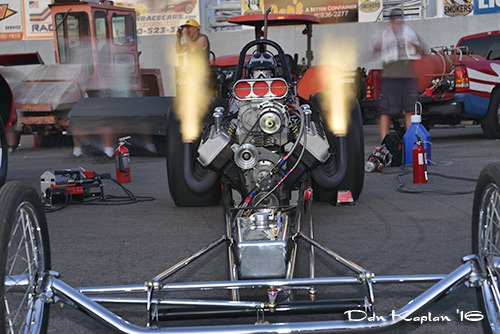 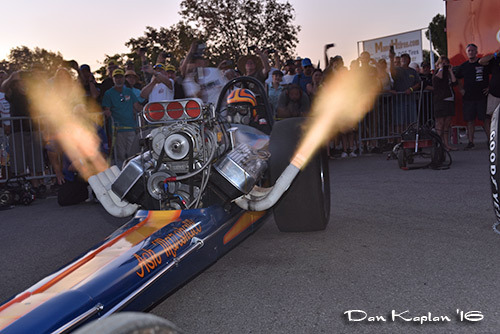 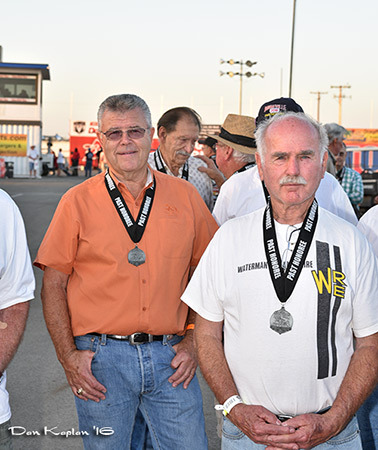 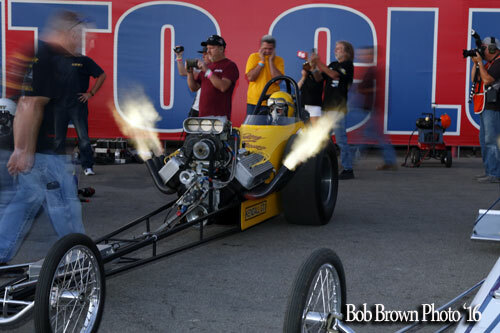 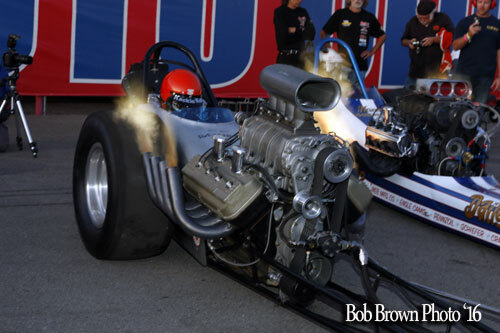 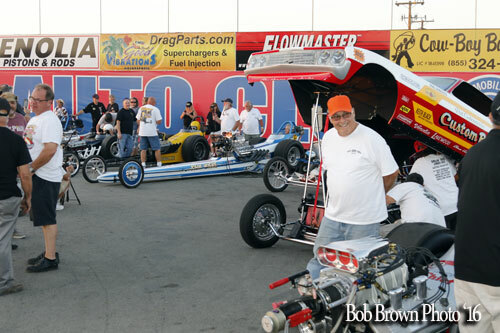 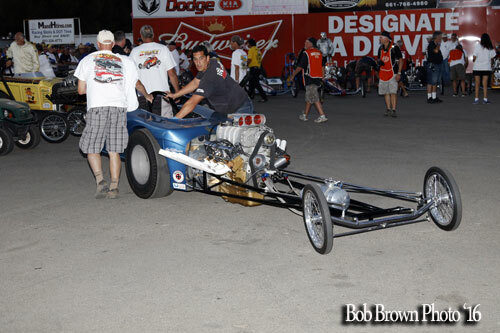 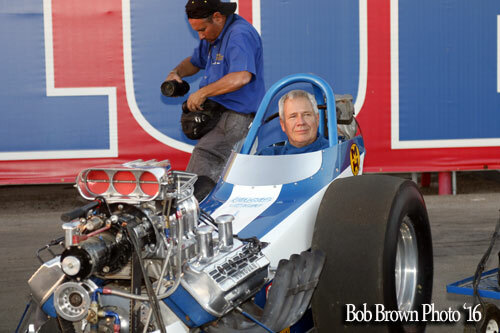 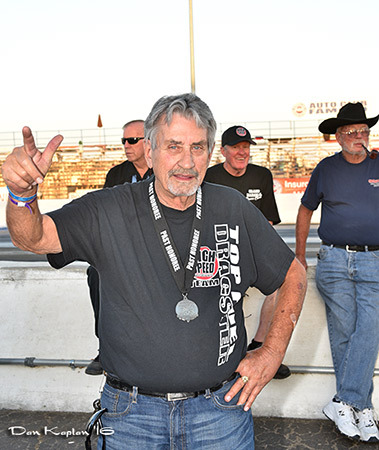 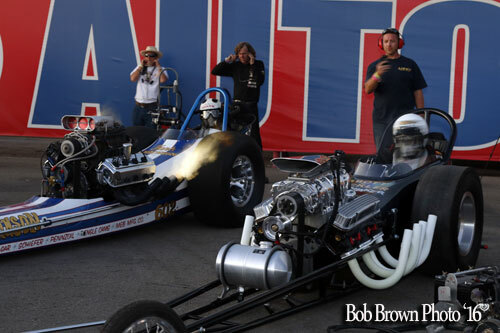 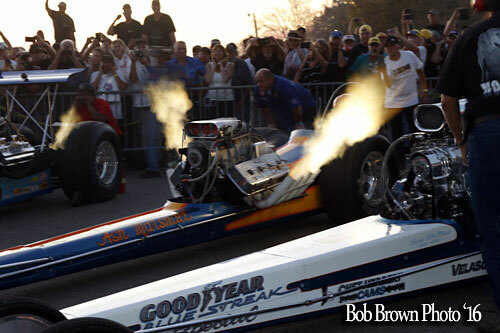 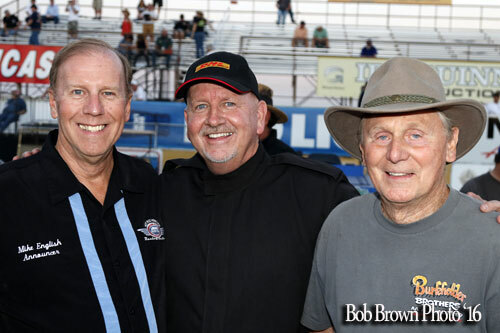 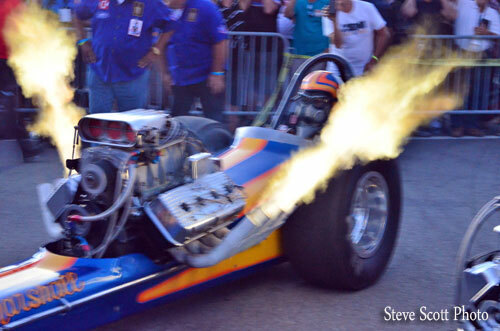 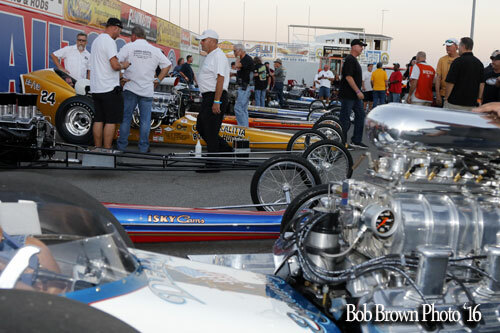 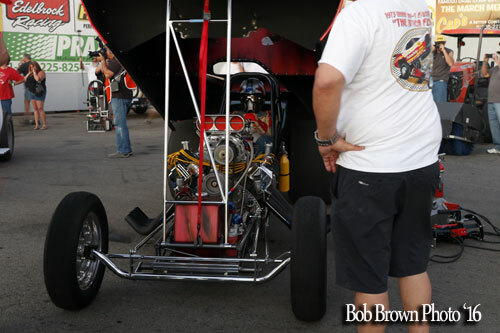 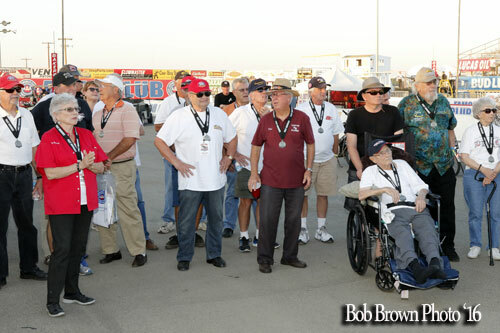 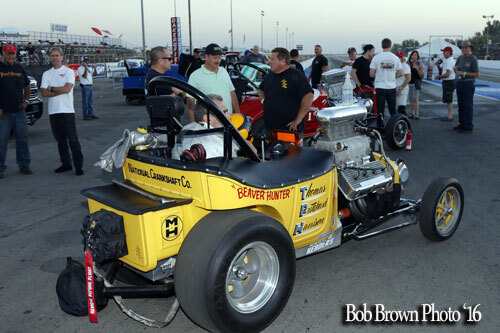 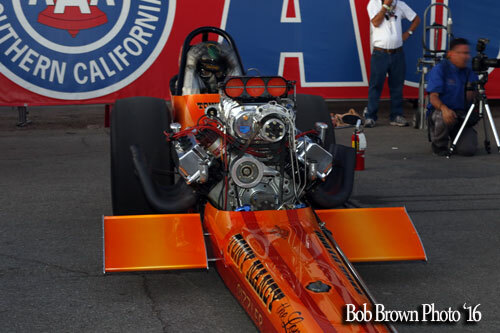 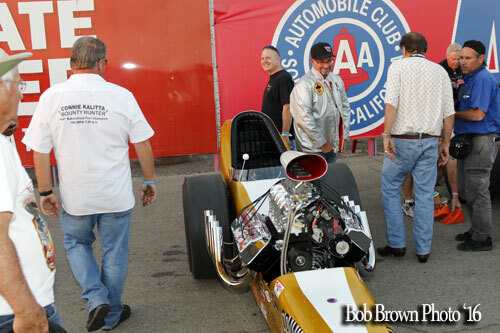 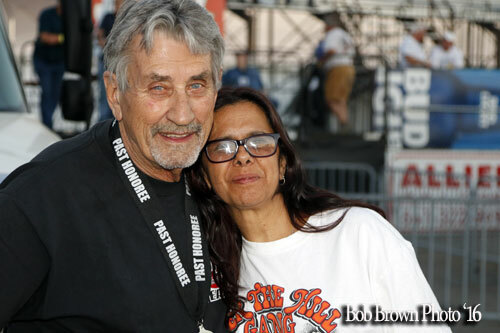 Bakersfield, CA - 10/26/16: Since 1992 when the first California Hot Rod Reunion took place, Bakersfield's Famoso Raceway has been the October destination of preference for many old and new drag racers and race fans. 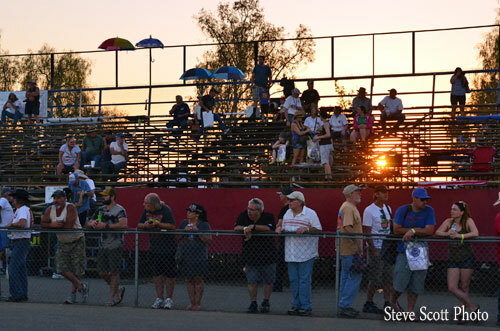 So it was in 2016 as well, with the 25th CHRR being the focus of attention for 15 to 20,000 people, including fans from many foreign countries as well as almost all, if not all, states. 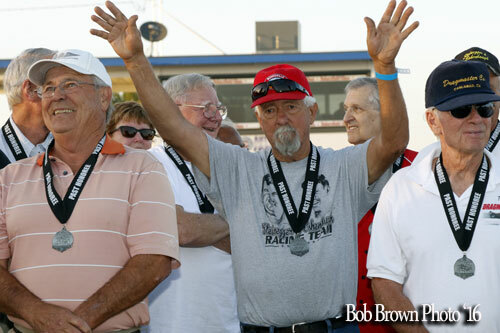 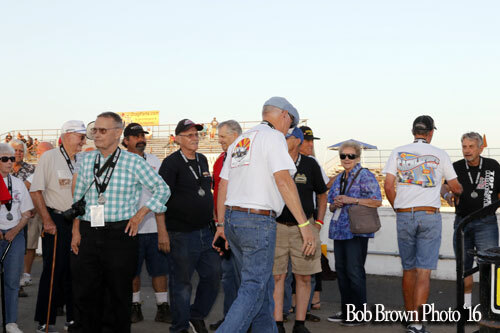 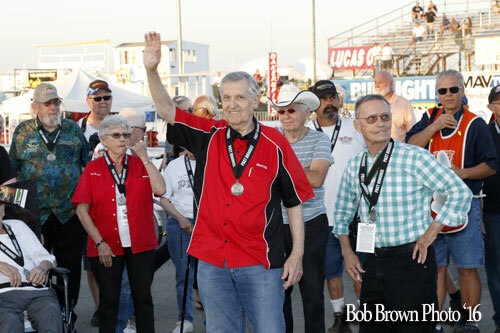 Once again the faithful gathered on a sunny weekend to visit, share recollections, watch some racing, look at vendor displays of all sorts and appreciate the collection of current nostalgia drag race cars there for the season finale. 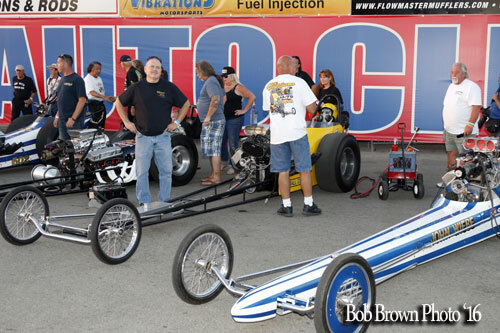 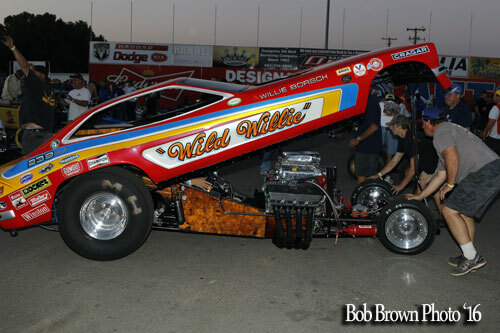 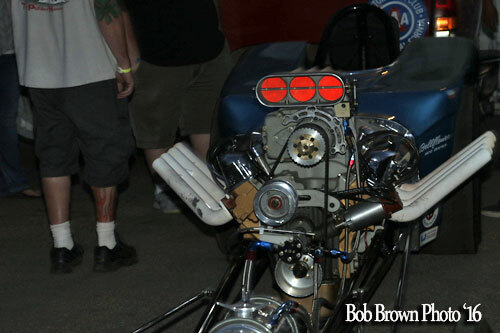 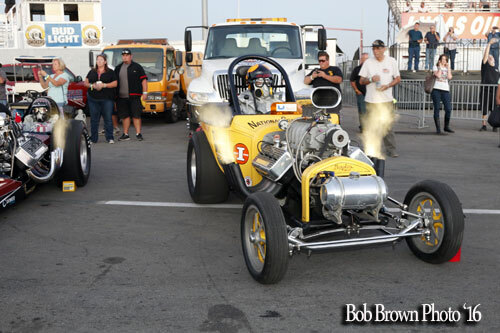 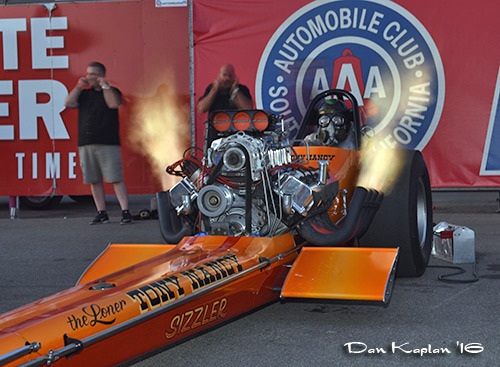 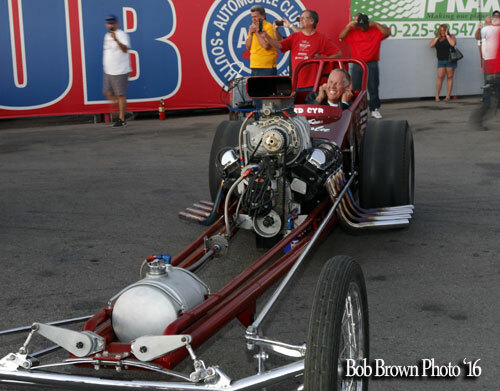 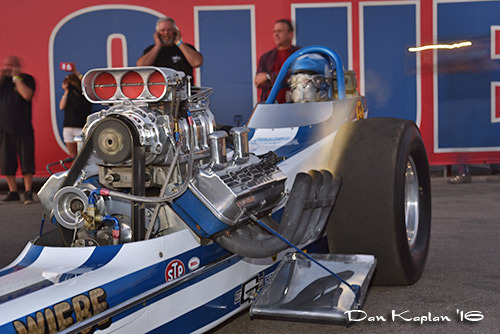 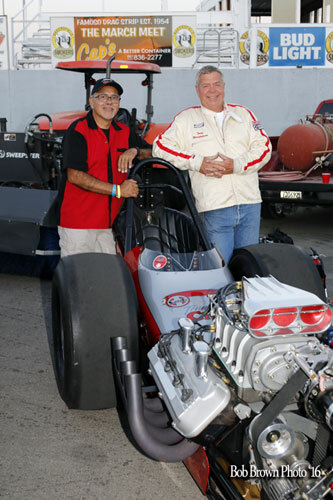 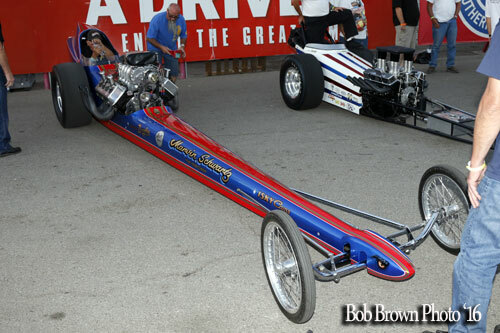 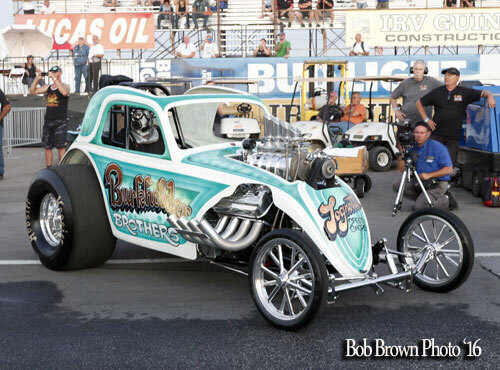 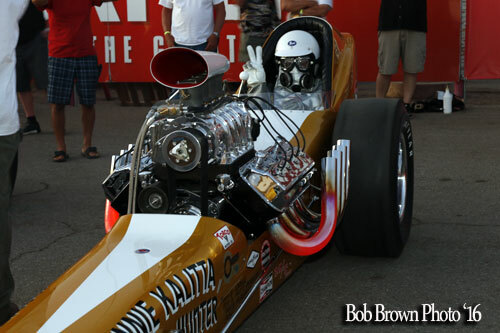 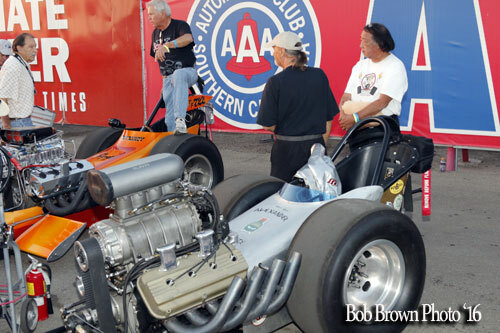 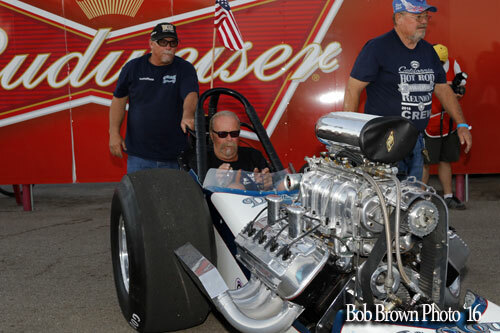 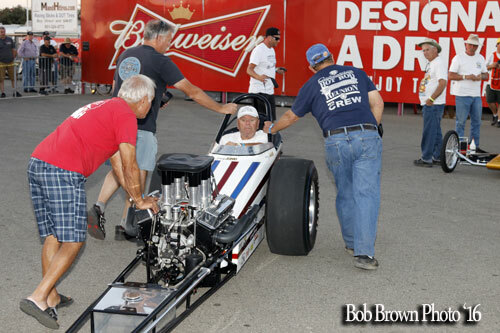 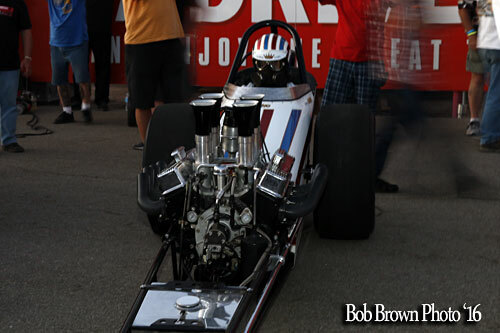 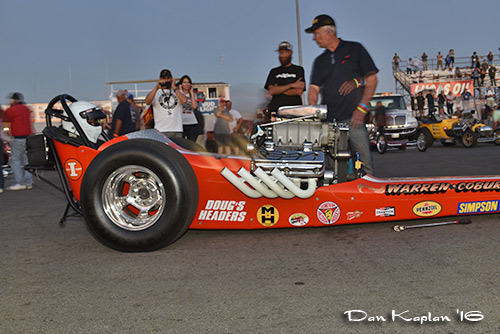 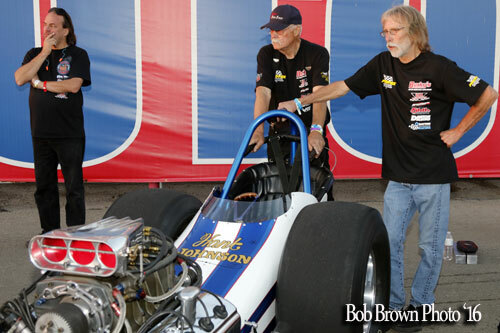 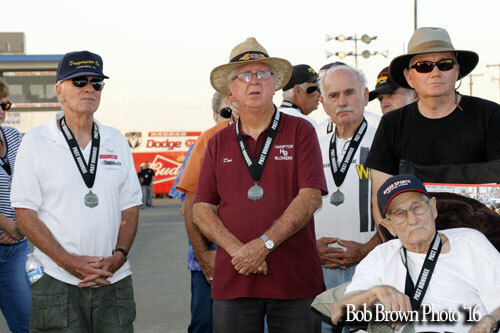 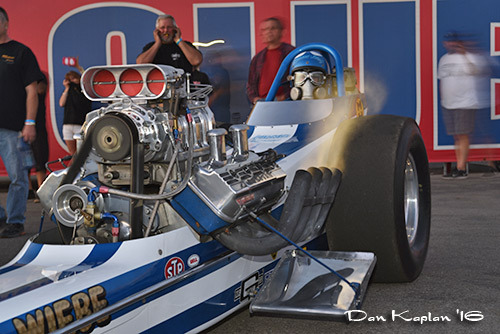 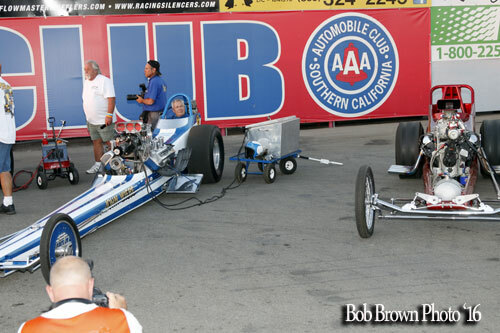 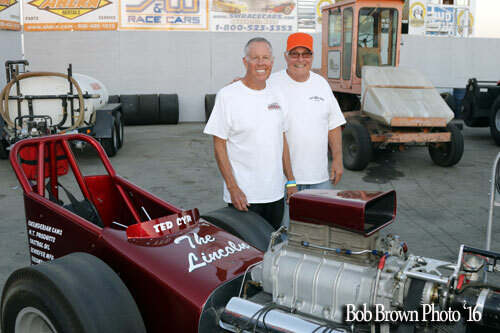 For many, the gathering of historic drag race cars that participate in the various facets of the Cackle Car activities, on track and in the pits, was enough lure by itself. 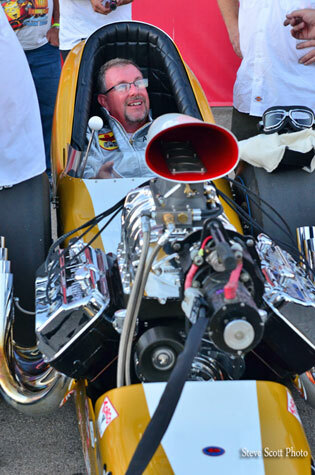 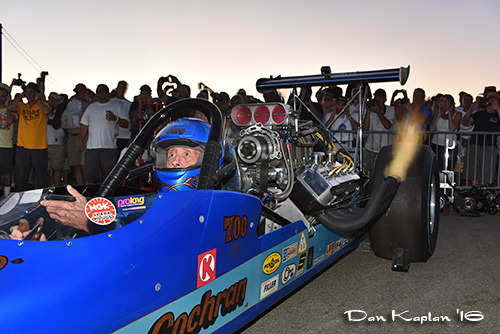 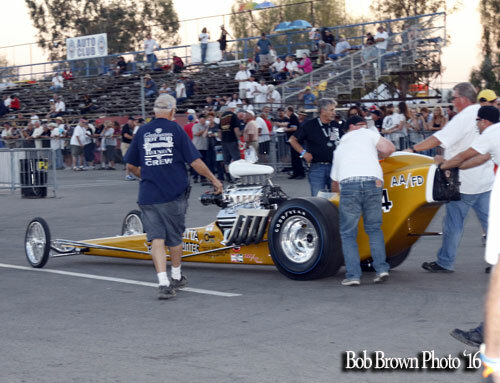 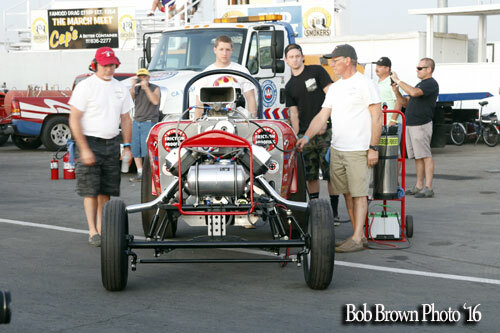 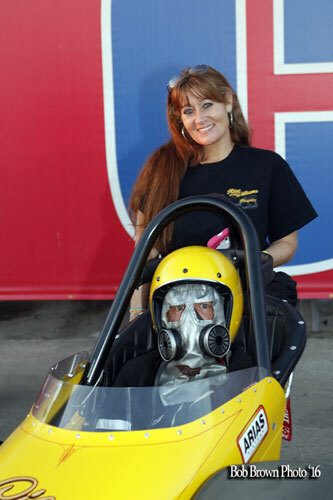 From the first concept in 1999 when Bill Pitts fired up his Magicar after a reading of names of racers lost during the year, to the 9 car push start in 2000, the Cackle Car activity has increased incrementally each year. 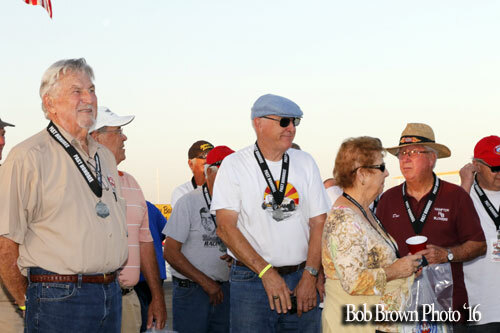 The second year there were nine cars that participated and all of them were original cars restored or unrestored and each one had historical importance dating back to the 60's or before. 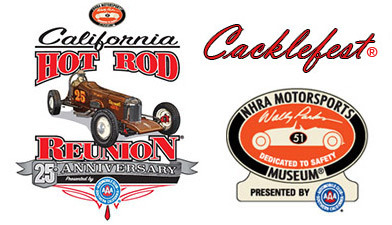 In subsequent years the collection of Cackle Cars has gradually increased until there have been close to 100 exhibition/display cars on the grounds. 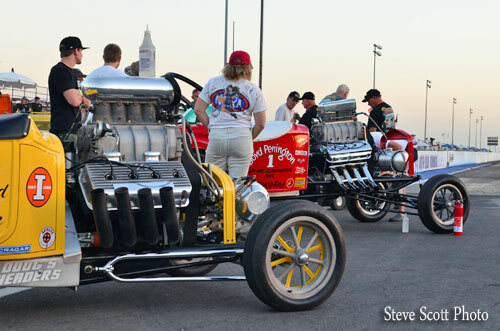 That surge in car count is because many original cars have been found and restored. 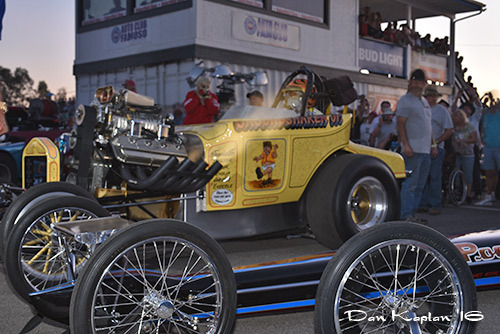 Many more have been built from scratch to replace a car that WAS a part of that era but has been lost or destroyed in the succeeding years. 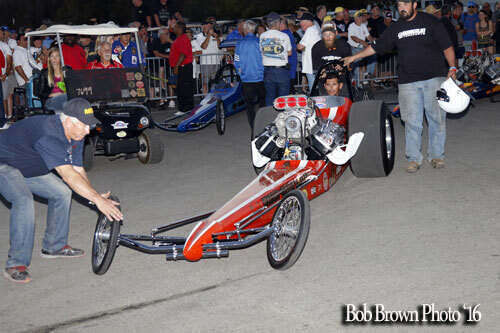 People who want to join in the activities have also adapted or built other cars that are representative of the 60's but were not really active in that era in the same persona as now displayed. 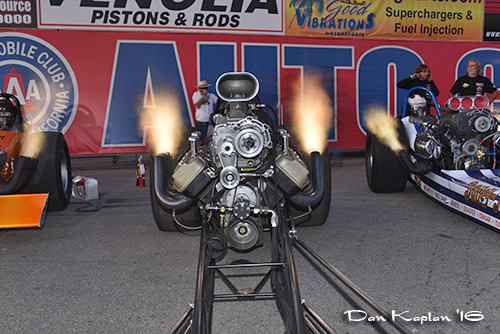 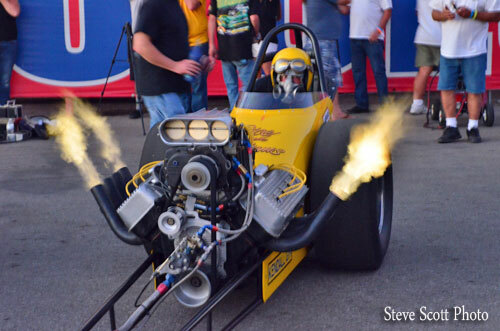 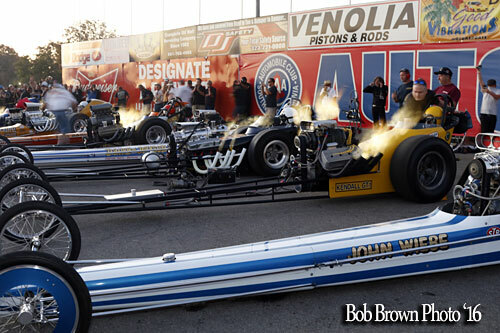 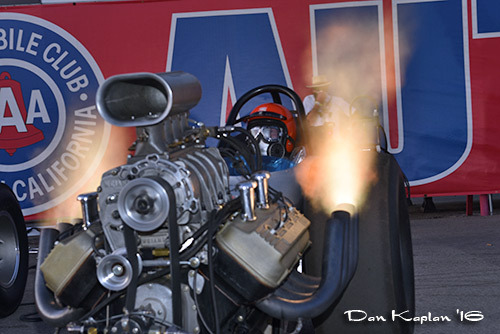 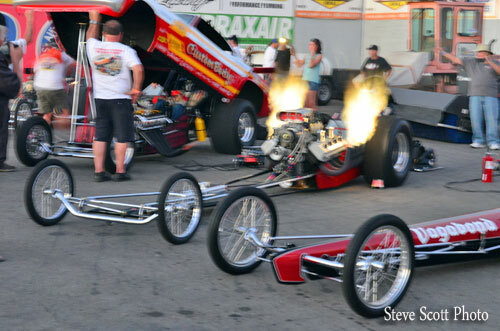 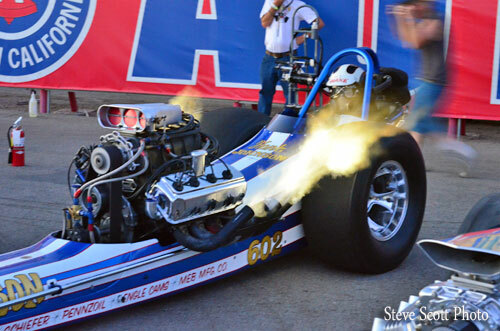 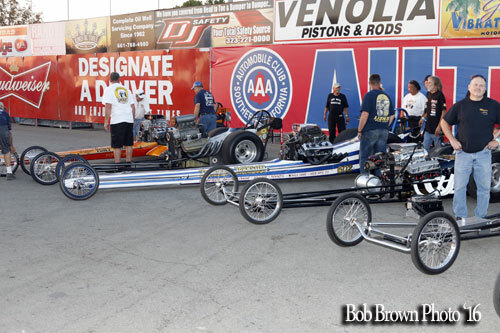 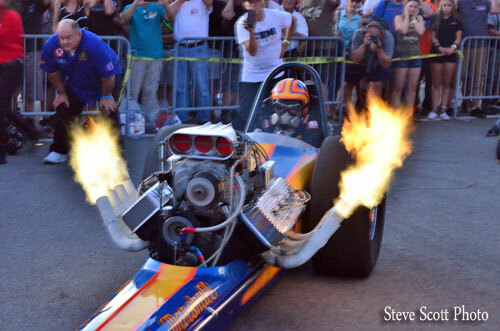 So the Cackle Car field is now made up of dragsters and AA/ Fuel Altereds that have three different lineages. 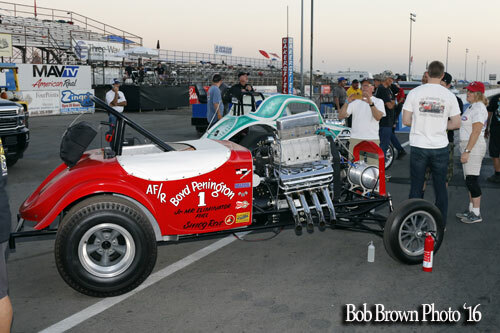 1) The original or restored cars that now appear in the same exact configuration that they were back then. 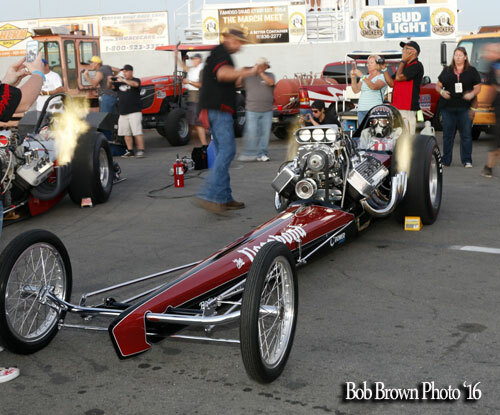 2) The re-creation of cars that were famous or at least verifiably active in the 60's. 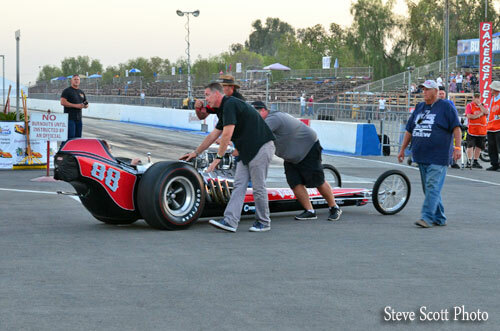 3) And the cars that represent the era but really have no heritage from the 60's in the form they appear today. 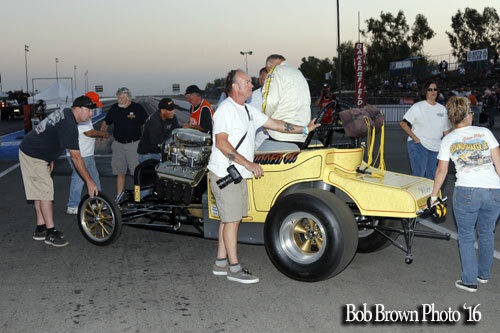 Up until this year, the lineage didn't matter and any and all cars capable of being push started safely were included in the field of the Cacklefest on Saturday night, with a high watermark of approximately 70 cars participating. 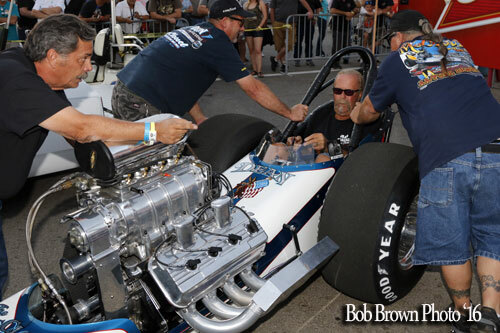 This year, decisions were made at executive levels that the program would be limited to a smaller number, but made up of historically significant cars and drivers. 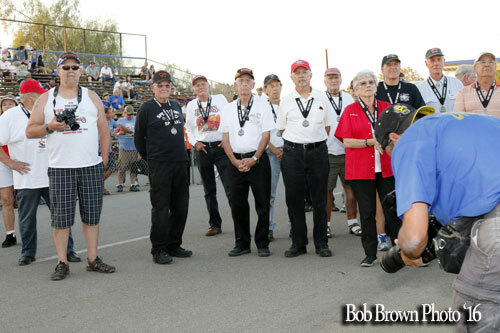 Also addressed was the practice of push starting the cars on the return road with nothing between the cars and the spectators but a 4 foot tall chain link fence. 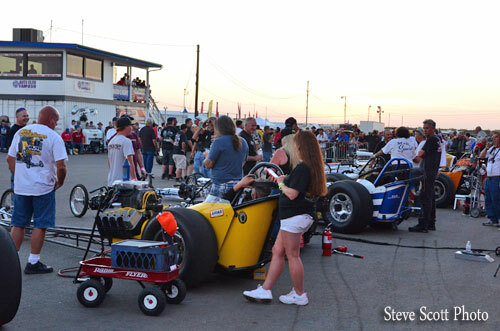 There had never been a serious incident during the previous years but a few minor incidents had occurred. 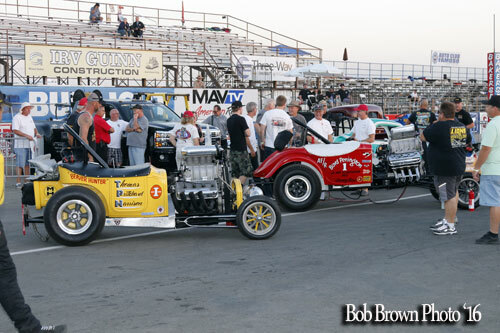 Safety concerns resulted in a change to have the cars paraded on the return road without engines running and then pushed out on the track and push started there at a distance from the spectators. 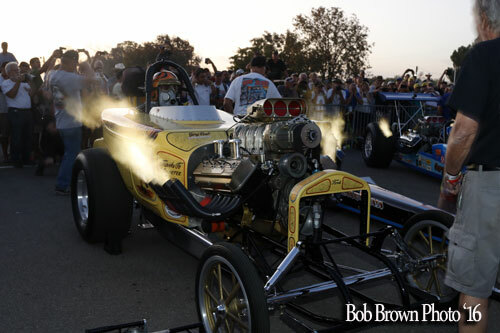 There were a few other modifications to the proceedings as well and like any changes, they were not universally well accepted. 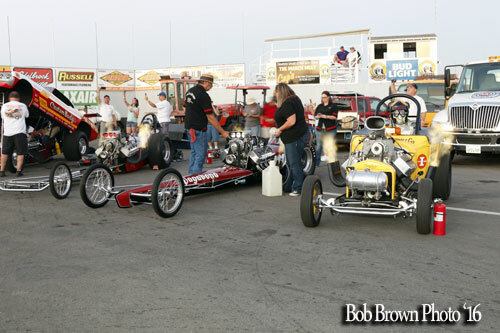 These modifications were subject to a dialogue between management and participants which ended up with a workable format. 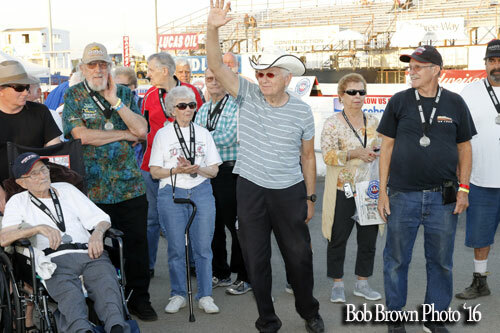 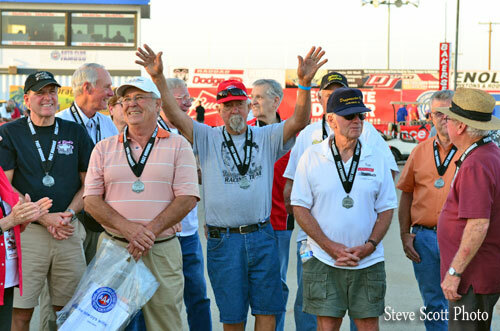 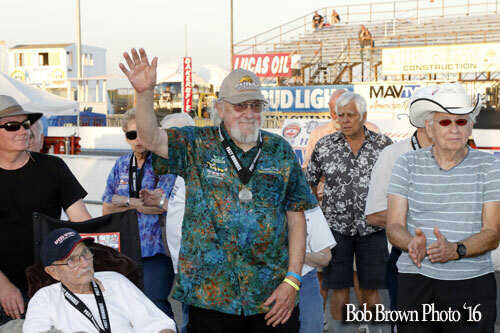 The Friday night activities at the Double Tree had been modified to have the 25th year awards portion largely take place at the track on a stage in front of the grandstand. 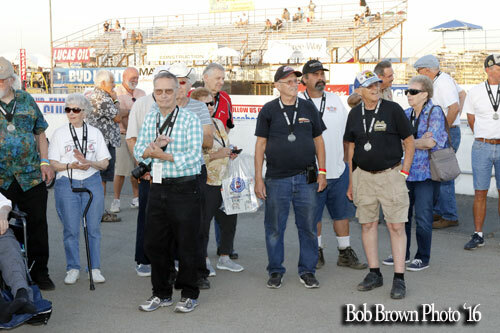 Following this a semi-circle "Ring Of Fire" of 25 volunteer cars placed on track between the back fence and the starting line were fired up in a rolling start and left running until the last one had been shut off. 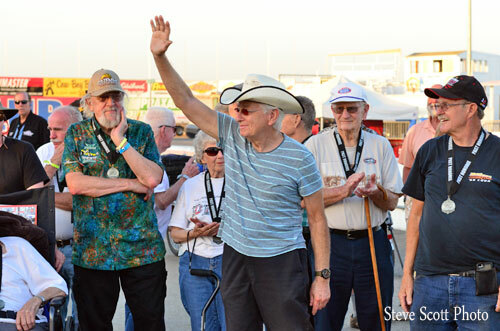 Capping the evening a cocktail hour and open get together took place at the Doubletree similar to the "after" events in previous years only this time with much fewer people. 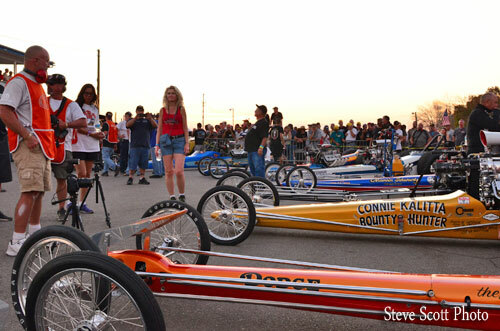 Saturday night, the Cacklefest was conducted as explained earlier, with a parade/push down the return road and push start and the running line-up all on the track. 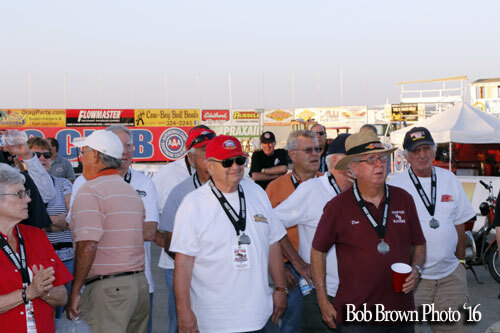 This event was limited this year to 40 cars which were selected by a "management committee" and included essentially the most authentic slate of cars, crews and drivers from the entry list. 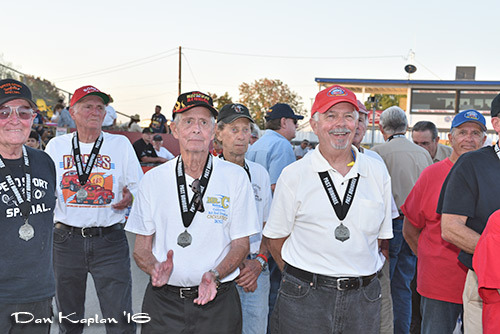 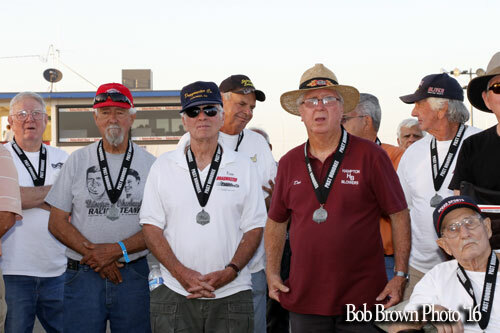 The 25th CHRR wound up Sunday with a static cackle in the morning in front of the grandstand and in the afternoon, as always, racing until the final pairings of race cars determined the season long series winners as well as the CHRR race winners. 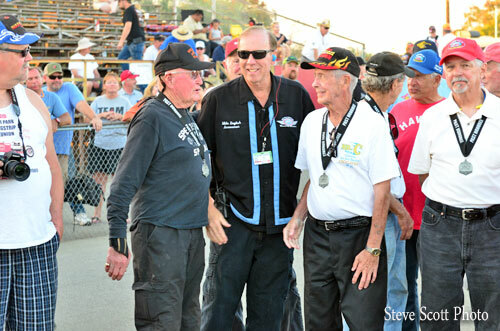 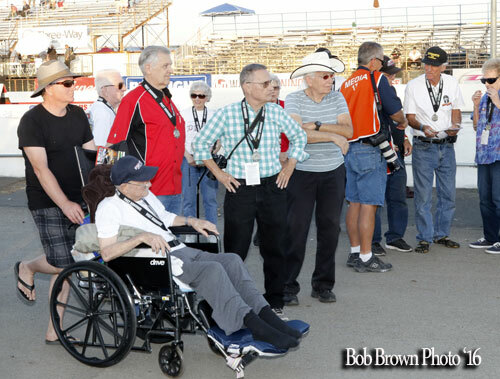 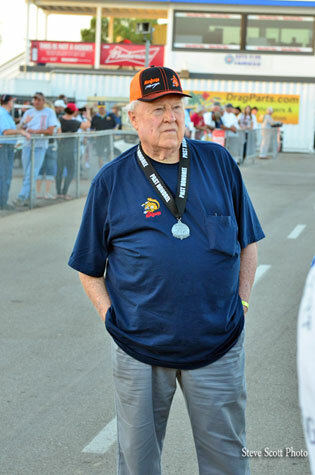 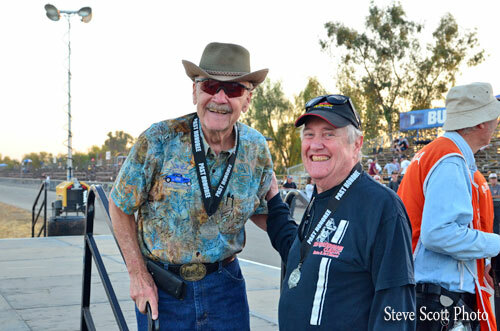 There is heavy coverage of the racing aspect of CHRR on Don Ewald's WDIFL website, which is linked below. 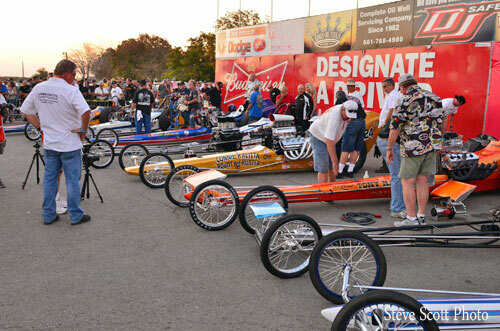 So, 25 years later, the CHRR continues to be the largest event of it's type in the world. 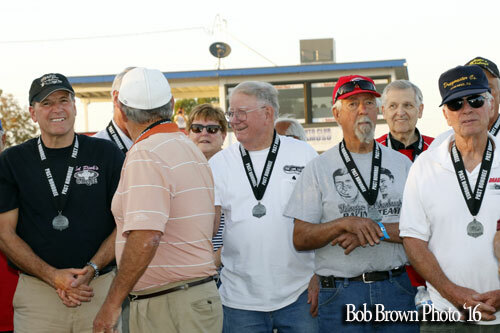 For 24 years the event has taken place without a great deal of controversy. 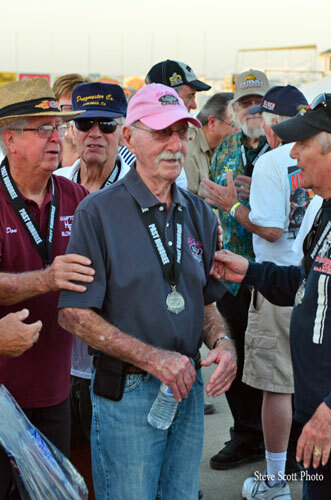 This year didn't achieve that same harmony. 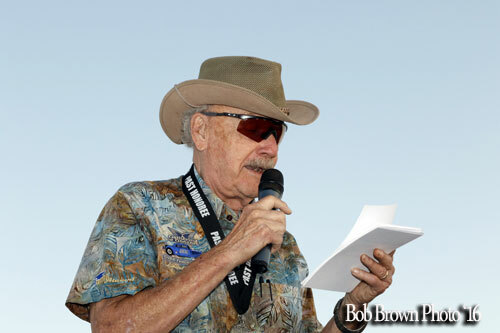 Other media sources will have explored the causes and effects of the disharmony at great length by the time we at Cacklefest.com get this story in front of you. 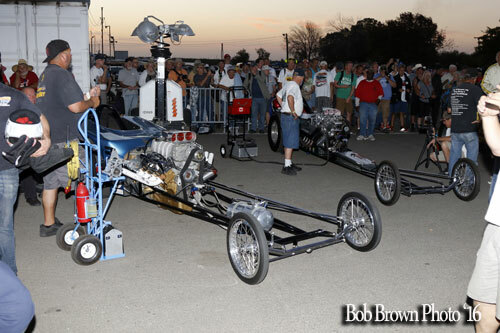 For sure 2017 will see things solidify as far as how the event will be run in the future. 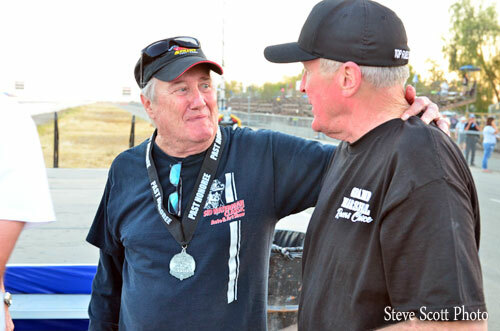 Keep in mind that one less than great year out of 25 years is 4%. 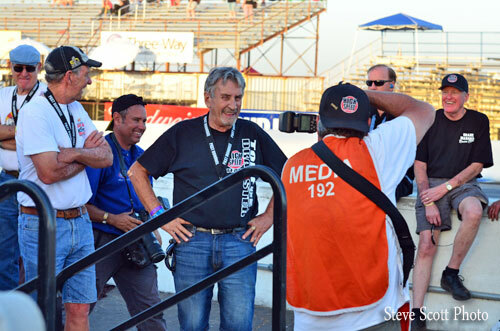 Most any sporting event in the world would be thrilled to have 96% of their history be positive. 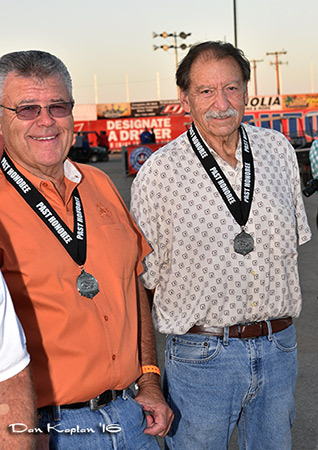 As previously noted, the traditional Honoree's Awards Show was not held at the Double Tree but at the track prior to the Ring of Fire. 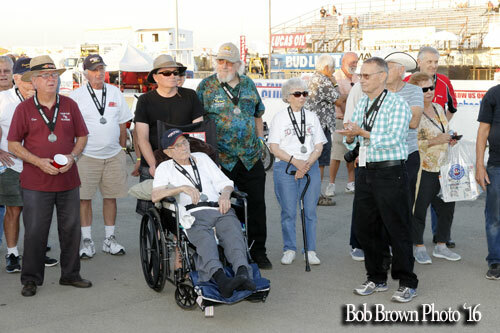 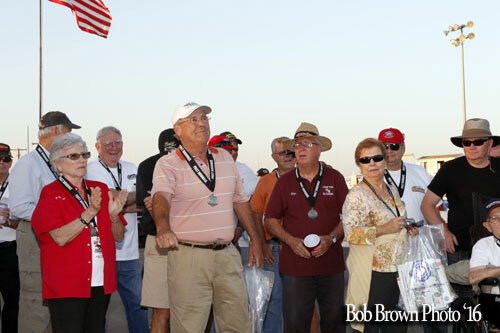 Previous Honorees were gathered and recognized. 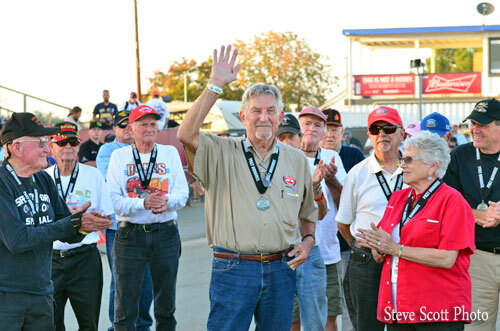 The casual recognition session was MC'd by the one and only Dave McClelland. 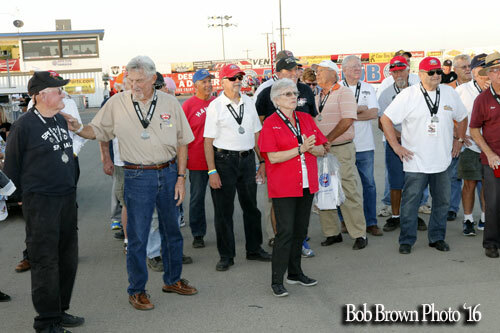 Not knowing all the names, we'll try to ID the folks we're sure of. 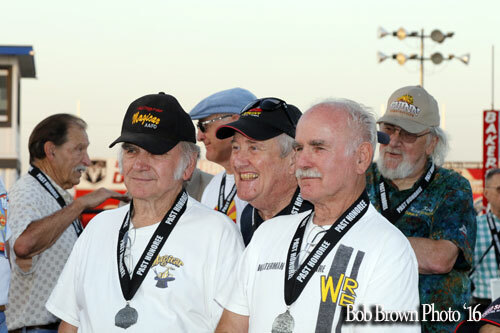 Jeep and Ronnie Hampshire with Sid Waterman in the middle. 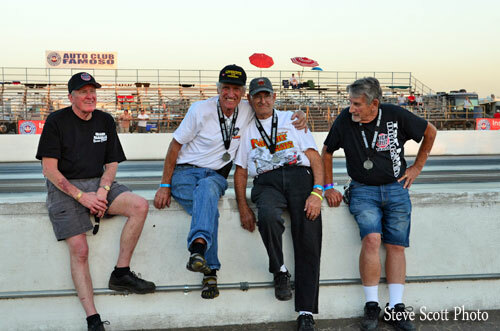 McCulloch, Harry Hibler, Hampshire and Kuhl. 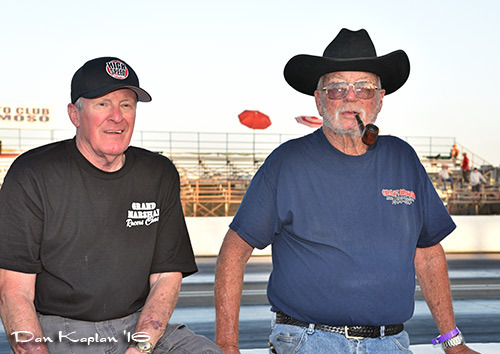 Two of the big three from the nitro wars, Ed Pink and Sid Waterman. 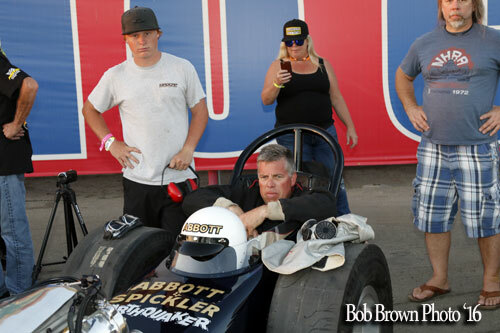 Abbott and Spickler - John Abbott Jr. 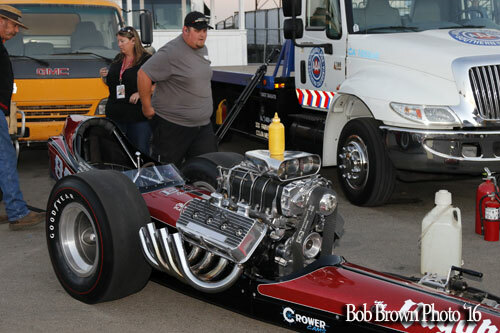 The whole deal took some time to get set up. 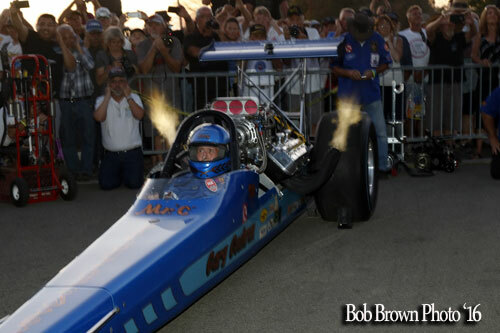 The first cars in started the arch and would also be first to fire-up. 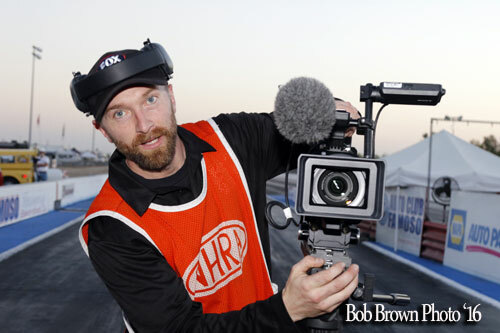 Congrats to video ace Les Mayhew for his new roll with FOX Sports. 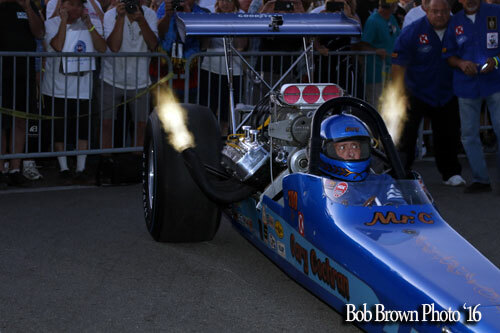 What was advertised as a ring of fire turned out to be an arch of fire. 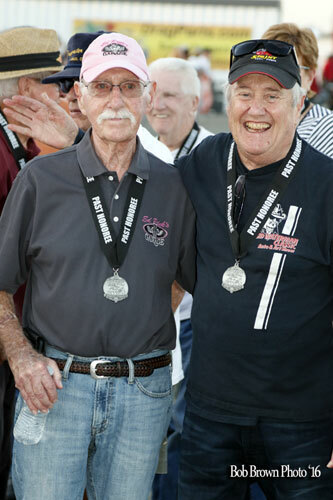 The cars were rapidly fired one at a time starting with the Burkholder Bros. AA/FA then going right to left. 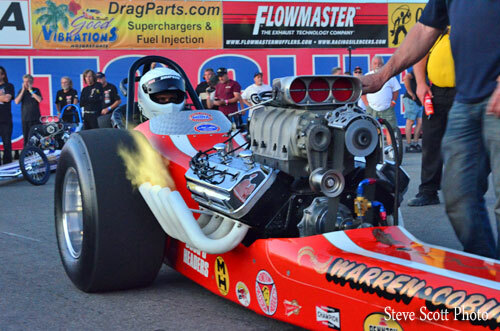 The final car fired was appropriately the Warren-Coburn & Miller fueler.